In August 2018, we purchased a series of advanced Picote mechanical drain cleaning machines, in order to add to our diverse drain cleaning methods. 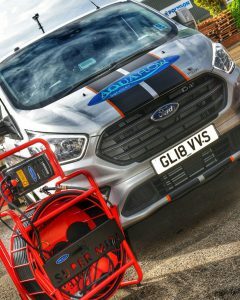 The transition to high speed mechanical cleaning improves control of the machine, whilst also boasting a wide range of accessories to meet the cleaning requirements asked of us, on varying sizes and materials of both external and internal pipework. The machine itself is more effective and efficient whilst also proving to be safer than conventional types of equipment currently on the market.